Pity poor Arthur, forever destined to be overshadowed by his more famous cousins, Sgt. Pepper and Tommy. 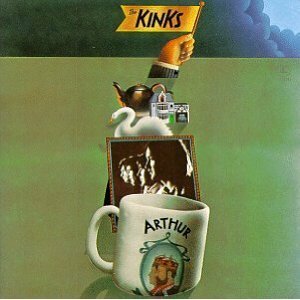 The Kinks’ 1969 album, Arthur (Or the Decline and Fall of the British Empire) is a neglected masterpiece from the golden age of concept albums. The Beatles were more polished, The Who rocked harder. All the Kinks were armed with was the best and most consistent batch of tunes of Ray Davies’ illustrious songwriting career. Received well by critics at the time of release, Arthur didn’t break commercially. That would happen the following year with “Lola,” perhaps the Kinks’ most enduring classic rock staple. Arthur is a twelve-song cycle about war and its aftermath. The opener, “Victoria,” is the bounciest pop tune ever written about imperial appetite and a perfect example of how a catchy ditty can be more subversive than a blatant call to arms. Davies inhabits his characters, using different vocal styles and accents. In “Yes Sir, No Sir,” he’s the lonely, confused soldier in “Mr. Churchill Says,” he’s the everyman, repeating wartime speeches and slogans verbatim. This deluxe re-mastered edition provides plenty of interesting morsels for the Kinks collector. Disc one is in mono, which limits the dynamic range of Dave Davies’ guitars and boosts Ray’s vocals. In the stereo version, Ray’s vocals are sometimes overshadowed by brother Dave’s busy, abrasive electric leads. The contrast is interesting, but perhaps only to the die-hard audiophile. There are plenty of B-sides and alternate takes. Dave gets his moment in the sun with a batch of his own garage rockers that never reach Ray’s heights, but have a grungy charm all their own. If all this seems like too much to sift through, then just buy the original twelve songs. None of the extras are vital. You’ll be shocked that something as great as Arthur, could’ve passed you by unnoticed.